From grand gestures to sweet nothings, Filipinos revel in sharing love to family and friends in celebration of Valentine’s Day. This month, make every moment count as Shell V-Power Nitro+, Shell’s premium performance fuels, helps you show your love to your family and friends with a limited-edition KIT KAT Valentine pack. For every Php 1000 single or accumulated purchase of Shell V-Power Nitro+ Gasoline, Shell V Power Nitro+ Diesel, or Shell V-Power Nitro+ Racing, customers can bring home a limited-edition KIT KAT Valentine pack for only P10. 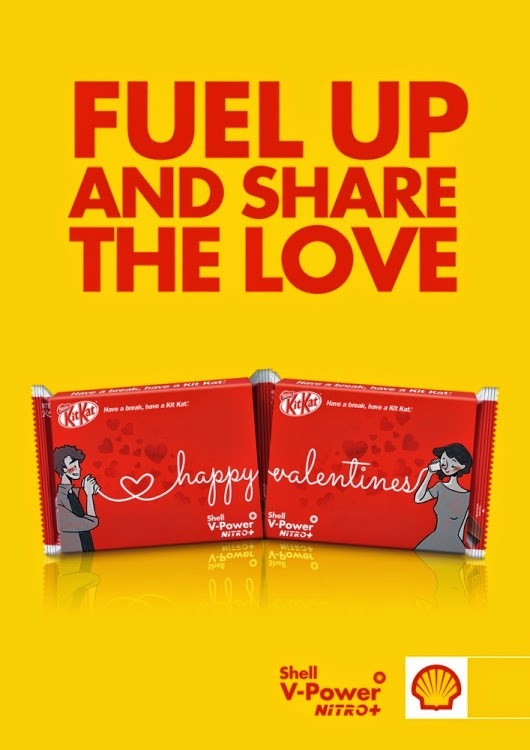 Motorists can also get a limited-edition KIT KAT Valentine pack for every Php 1500 single or accumulated purchase of Shell FuelSave Gasoline. “This February, make Valentine’s Day a month long celebration and bring home a splendid surprise that will surely make your loved ones feel special. Enjoy the excitement on the road with our fast acting performance fuels, Shell V-Power Nitro+, and make your road trips with family and friends extraordinary and delightful with the limited-edition KIT KAT Valentine pack,” said Yam. Invite your friends and family to fuel up at the nearest Shell station and grab the limited-edition KIT KAT Valentine pack. Promo runs from February 1 to February 28, 2015.
tsk tsk tsk..hindi kasama ung fuel save :( eh un lang nilalagay ko e.